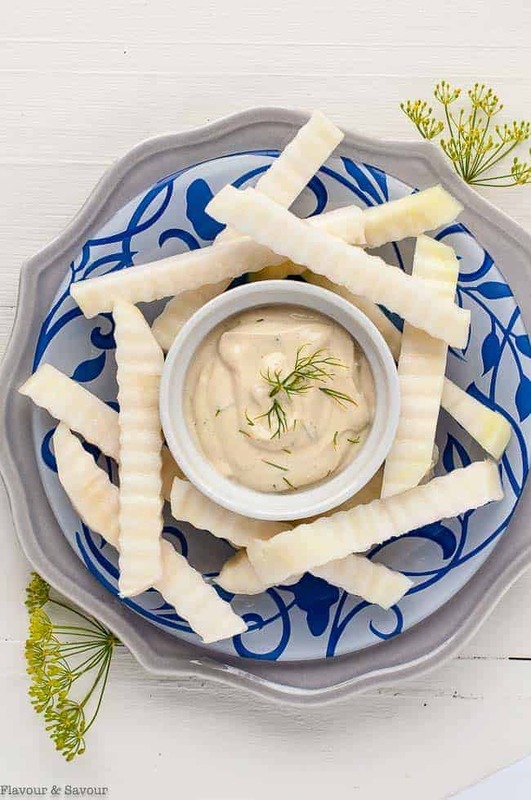 Nutrient-rich Crispy Raw Kohlrabi Sticks with Dijon Dilly Dip make a delicious healthy snack. Great for lunch boxes! Ideal for those on a Keto diet, too. These raw kohlrabi sticks are as crisp and juicy as an apple with a slight nutty flavour. You might think they’re similar to raw broccoli stalks but they’re one hundred times better! 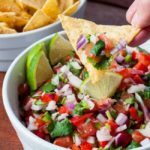 Since they have a mild flavour, I paired them with a dip with strong flavours. 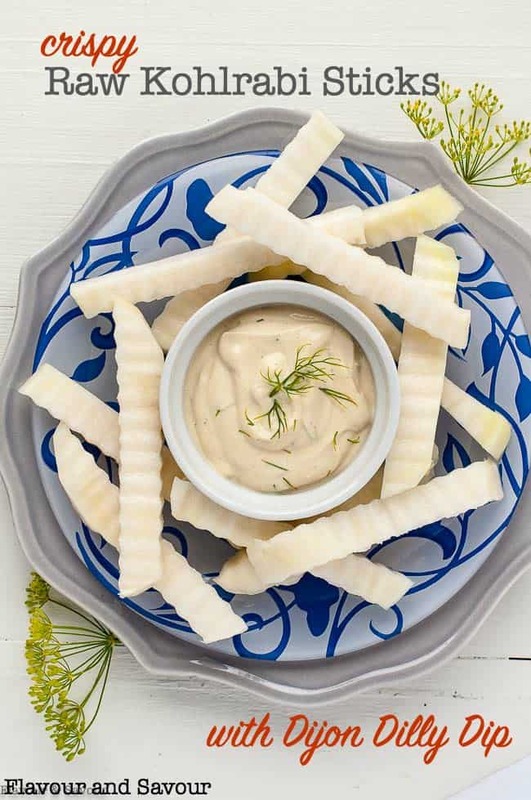 This Dijon Dilly Dip has a creamy texture and a bite from the Dijon and dill. Delish! 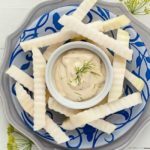 And while I love this dill-flavoured dip, these kohlrabi sticks would also be great with my Mayo-Free Avocado Green Goddess Dressing. If you’re not familiar with kohlrabi, let me tell you about it. First of all, it’s pronounced COAL-ROB-EE. It’s a member of the turnip family, but it doesn’t taste like turnip. It’s popular in Germany and other eastern European countries, (in fact, it’s sometimes called a German turnip) but here in North America we’ve been a little slow in realizing its nutritional benefits. Is Kohlrabi good for you? 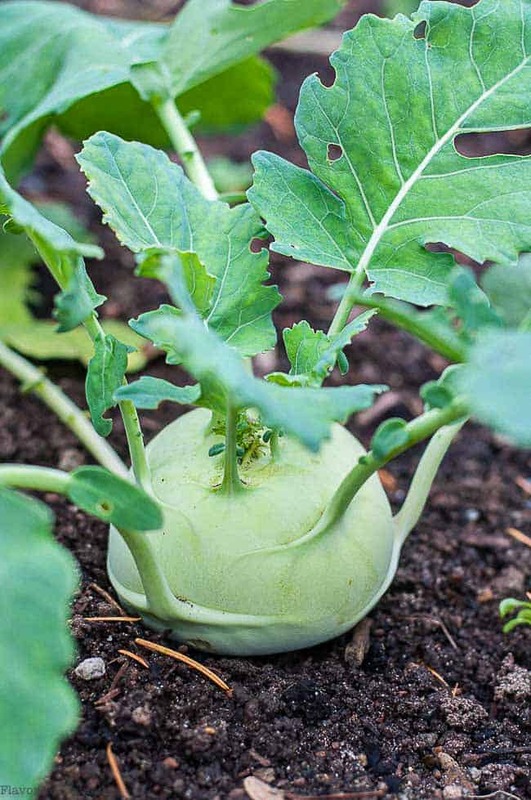 Kohlrabi is a powerhouse of nutrition. It’s low in calories, low in carbs, and as a cruciferous vegetable, it’s a cancer-fighter. It also improves heart health and decreases the risk of diabetes and obesity. And . . . it tastes great! 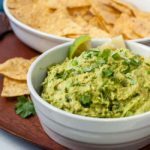 It’s a healthy snack for anyone and it’s keto-friendly, too. The globe-shaped stem of the plant is the part that you’ll discover in supermarkets or in farmer’s markets. It can be white, light green, or even purple. I like it raw in salads like this Kohlrabi Winter Salad, but I also like it cooked in this crustless paleo Kohlrabi Quiche. How do you cut kohlrabi? Start by removing the stalks (if they haven’t already been trimmed.) Slice off both the stem end and the root end. Next, remove any of the stalks or leaves that may be left on the sides. Then use a sharp vegetable peeler or a paring knife to remove the tough skin. And finally, use a sharp knife to cut slices and then trim those into sticks. 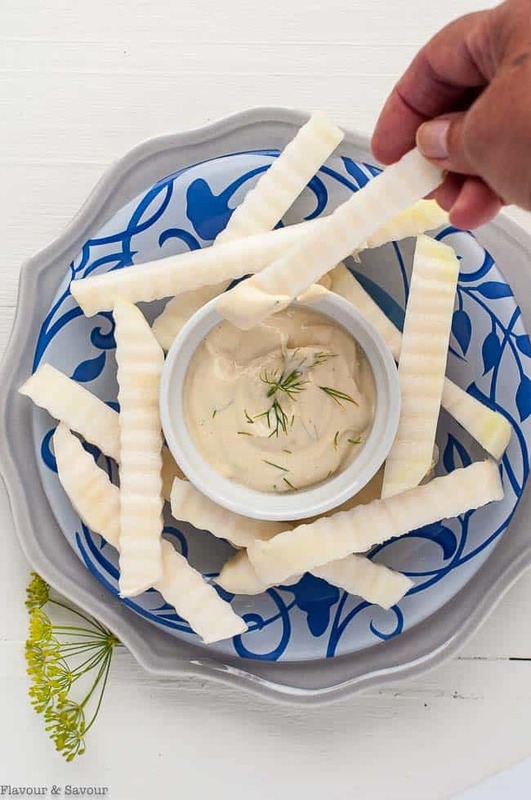 Using a handheld crinkle cutter makes these raw kohlrabi sticks so much more fun to eat, don’t you think? Sometimes if you’re trying to convince kids to try a new veggie, cutting it in a different shape is all they need to give it a try. I use this crinkle cutter for other firm veggies too, like carrots and beets. I hope you’ll give kohlrabi a try next time you see it in the produce section! 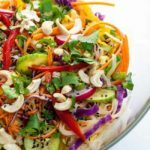 It’s inexpensive, it’s nutritious, and it’s delicious! Combine Greek yogurt, mustard, lemon juice, fresh dill and sea salt in a small bowl. Set aside to allow flavours to blend. 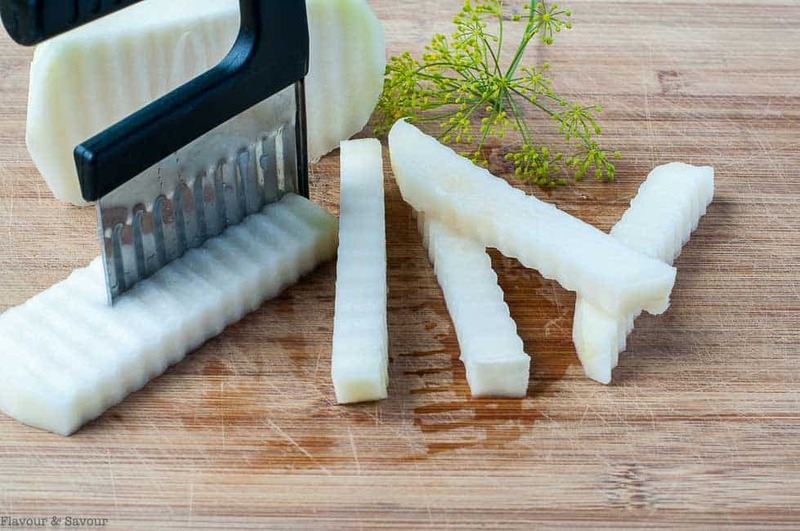 Using a handheld crinkle cutter, slice peeled kohlrabi into sticks. Toss with lemon juice to prevent browning. Serve with Dijon Dilly Dip. I had never tried kohlrabi before, so I didn’t know what to expect, but I was agreeably surprised! This stuff is good!! I cut it up with other vegetables and had it with that yummy dip. I’ll be buying this whenever I see it in the store from now on! 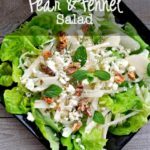 It’s crispy, crunchy and low carb! So glad you like it!